Disinfectant and antiseptics are widely used for cleaning in both health care settings and also in homes. These products contain various chemical components, a majority of which have been used as cleaning agents for ages. Disinfectant and antiseptics are widely used for cleaning in both health care settings and also in homes. These products contain various chemical components, a majority of which have been used as cleaning agents for ages. It's a fact that they are both used for destroying disease-causing microorganisms which may lead people to think that they are the same. But the truth is that they are very different in many ways especially on how they are applied. Disinfectants are chemical substances that can be applied to non-living objects or surfaces to inhibit the growth of microorganisms. They prevent the spreading of germs and bacteria to people by sterilizing the surfaces where they are applied. Disinfectants are largely used in homes for cleaning bathrooms, kitchens, and floors. Some disinfectants such as hydrogen peroxide are used in healthcare settings and hospitals to clean surgery tools and rooms. The most common disinfectants are alcohols, oxidizing agents and bleaches. It's important to note that disinfectants may not necessarily eliminate all the microorganisms. Some microorganisms may be resistant to some disinfectants becoming difficult to kill them completely. So the disinfectants can only reduce the microorganisms to a level which they can't bring harm to health or harm the quality of perishable products. In such cases, the best thing to do is use disinfectants of higher concentration for maximum results. Antiseptics are chemical agents used to destroy or prevent the growth of microorganisms that could cause infections or diseases. They are applied on broken skins to kill disease-causing microorganisms that might have infected the areas or keep them away from these areas. Antiseptics are therefore meant to be applied on living tissues with zero injurious effect on the body surface where it is applied. Antiseptics may also act as sanitizers for cleaning hands to remove bacteria when a person cannot wash hands. They are popular in products like mouthwash, cold sores, treatment creams, etc. and the list is long. 1. Disinfectants are applied to non-living items while antiseptics are applied to living tissues. They both prevent the spread and infection by disease-causing microorganisms to people. 2. Disinfectants inhibit the growth of microorganisms that exist on surfaces that they are applied on while antiseptics kill and destroy microorganisms on living tissues. 3. Disinfectants disinfect areas that can spread germs while antiseptics reduce the risk of infections by germs. 4. Disinfectants are very toxic and injurious when used on living tissues while Antiseptics have no injurious effect on living tissues. 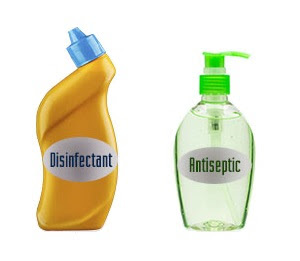 Considering the differences between disinfectants and antiseptics mentioned above, it's clear that their main difference is on their application. Many people have often interchangeably applied one in place of the other not knowing they are used differently. It would explain why some people fail to control germs or still get bacterial infections despite their constant use of anti-microbial agents. The problem is on how they use the agents. It's important to note that the application of disinfectants and antiseptics is totally different.